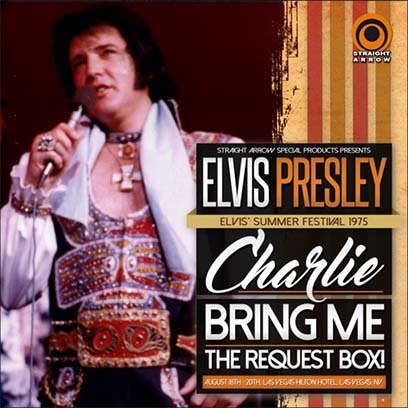 CHARLIE, BRING ME THE REQUEST BOX! 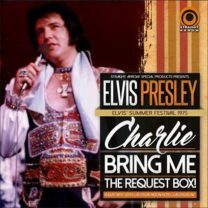 La Straight Arrow ha annunciato l’uscita di un nuovo box intitolato “Charlie, Bring Me The Request Box!” con i concerti registrati tra il 18 e il 20 agosto 1975 a Las Vegas. Infine, il concerto di mezzanotte del 20 agosto 1975, è stato pubblicato solamente una volta nel 1994 dalla Top Acts con il titolo “Top Acts In Vegas Vol. 2” e faceva parte di una serie di sette volumi intitolati appunto “Top Acts In Vegas”. 01. Opening Vamp / C. C. Rider – 02. I Got A Woman / Amen – 03. Love Me – 04. If You Love Me (Let Me Know) – 05. Blue Suede Shoes (by request) – 06. Suspicious Minds (by request) – 07. My Boy (by request) – 08. Heartbreak Hotel – 09. Polk Salad Annie – 10. Introductions of singers, musicians – 11. Johnny B. Goode – 12. Drum Solo (Ronnie Tutt) – 13. Bass Solo (Blues – Jerry Scheff) – 14. Piano Solo (Glen D. Hardin) – 15. School Day – 16. T.R.O.U.B.L.E. – 17. The Wonder Of You – 18. Why Me Lord – 19. How Great Thou Art – 20. Can’t Help Falling In Love – 21. Closing Vamp. 01. Introduction: Also Sprach Zarathustra – 02. C. C. Rider – 03. I Got A Woman / Amen – 04. Blue Suede Shoes (by request) – 05. If You Love Me (Let Me Know) – 06. It’s Now Or Never – 07. My Boy (by request) – 08. Love Me – 09. Loving You (by request) – 10. Suspicious Minds (by request, performed last time ever) – 11. Introduction of Vernon Presley / Introductions of singers, musicians – 12. Johnny B. Goode – 13. Drum Solo (Ronnie Tutt) – 14. Bass Solo (Blues – Jerry Scheff) – 15. Piano Solo (Glen D. Hardin) – 16. School Day #1 – 17. School Day #2 – 18. Introduction of Neil Sedaka – 19. T.R.O.U.B.L.E. – 20. Why Me Lord – 21. How Great Thou Art – 22. Let Me Be There – 23. Crying In The Chapel (by request, performed 1st time) – 24. Can’t Help Falling In Love – 25. Closing Vamp. 01. Introduction: Also Sprach Zarathustra – 02. C. C. Rider – 03. Elvis talks – bathroom story – 04. Blue Suede Shoes – 05. Young And Beautiful – 06. Are You Lonesome Tonight (by request) – 07. If You Love Me (Let Me Know) – 08. Softly As I Leave You (by request, with Sherrill Nielsen) – 09. It’s Now Or Never (by request) – 10. Polk Salad Annie – 11. Introductions of singers, musicians – 12. Johnny B. Goode – 13. Drum Solo (Ronnie Tutt) – 14. Bass Solo (Blues – Jerry Scheff) – 15. Piano Solo (Glen D. Hardin) – 16. School Day – 17. Introduction of Vernon Presley – 18. Introduction of Righteous Brothers / You’ve Lost That Lovin’ Feelin’ (excerpt) – 19. T.R.O.U.B.L.E. (with false start) – 20. Why Me Lord – 21. Love Me Tender (by request) – 22. All Shook Up – 23. Love Me – 24. Hound Dog / Are You Sincere (excerpt) / Hound Dog (by request) – 25. My Boy (by request) – 26. Can’t Help Falling In Love (with false start) – 27. Closing Vamp. 01. Introduction: Also Sprach Zarathustra – 02. C. C. Rider – 03. I Got A Woman / Amen – 04. Hound Dog (by request) – 05. It’s Now Or Never (by request) – 06. And I Love You So (with false start) – 07. Blue Suede Shoes – 08. Green Green Grass Of Home (by request, performed last time ever) – 09. Fairytale – 10. Softly As I Leave You (with Sherrill Nielsen) – 11. Introductions of singers, musicians – 12. Johnny B. Goode – 13. Drum Solo (Ronnie Tutt) – 14. Bass Solo (Blues – Jerry Scheff) – 15. Piano Solo (Glen D. Hardin) – 16. School Day – 17. T.R.O.U.B.L.E. – 18. Why Me Lord – 19. Until It’s Time For You To Go (by request) – 20. Burning Love – 21. Can’t Help Falling In Love – 22. Closing Vamp. 01. Opening Vamp / That’s All Right / C. C. Rider / That’s All Right – 02. I Got A Woman / Amen – 03. Fever (by request) – 04. If You Love Me (Let Me Know) – 05. Until It’s Time For You To Go (by request) – 06. Softly As I Leave You (with Sherrill Nielsen) – 07. Burning Love – 08. Introductions of singers, musicians – 09. Happy Birthday to James Burton – 10. Johnny B. Goode (James Burton, instrumental) – 11. Drum Solo (Ronnie Tutt) – 12. Bass Solo (Blues – Jerry Scheff) – 13. Piano Solo (Glen D. Hardin) – 14. School Day – 15. Introduction of The Carpenters – 16. T.R.O.U.B.L.E. (performed last time ever) – 17. It’s Now Or Never (by request) – 18. Why Me Lord – 19. Let Me Be There – 20. Can’t Help Falling In Love – 21. Closing Vamp.